There were 5 posts published in September (this is page 1 of 1). Safe 6 does exist in the wild!! Evidence of “Safely Working” in the wild has been obtained. Placed right next to the OSHA poster is our “Push All The Right Buttons” poster. It was observed and photographed in the break room of an unnamed manufacturing facility in Pittsburgh. 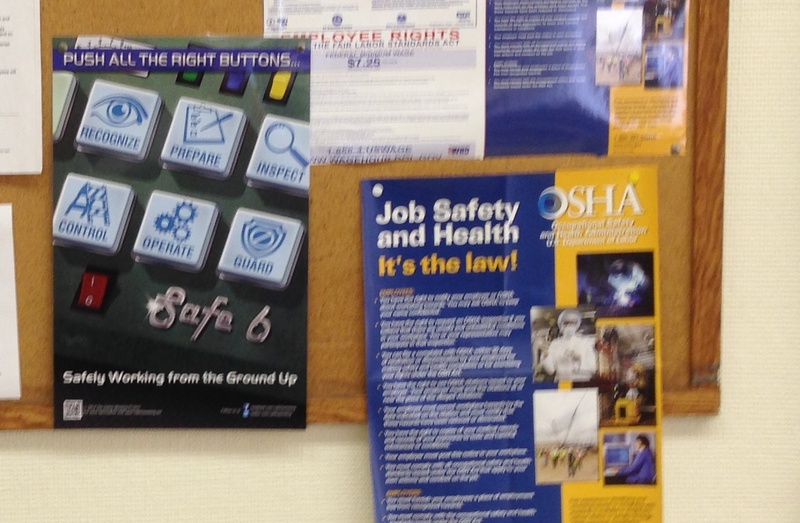 If you have observed Safe 6 in the wild, please send us the photo so we can continue to prove that Safe 6 is being adopted in workplaces everywhere! “Safe 6″ is a registered trademark of Trailmarker Ltd.
“Safely Working” is a trademark of Trailmarker Ltd. Yesterday afternoon, I spoke to members of the Northwestern Pennsylvania Chapter of the ASSE in Erie. I’m very appreciative that they gave me the opportunity to tell them about The Safely Working Project. Thanks to the Chapter President, Jon, for getting me on the meeting schedule. These events are good for a couple reasons. First and foremost, I am getting the word out on Safe 6. Secondly, these are great opportunities to field questions and refine my presentation of Safe 6 and The Safely Working Project. It all makes sense in my brain, but sometimes I not sure if I’ve done an effective job at communicating my message. Next up is the Western PA ASSE Joint PDC in at the Kovalchick Convention Complex in Indiana, Pennsylvania October 16. We are a sponsor of the PDC and will have a staffed table ready to tell folks about The Safely Working Project and Safe 6. If that goes well we are considering the New England PDC in December. Next Wednesday, September 17, Dave Shafer will be introducing “The Safely Working Project” to members of the Northwestern Pennsylvania Chapter of the ASSE. The meeting is at noon in Erie. Contact us if you want information on attending the meeting. I just uploaded 2 substantial documents to the download forum in Safe6.org. I upgraded both the OSHA Construction Industry Digest and the OSHA General Industry Digest. Both documents have sidebars with notes, highlighted key terms including “training” and “competent person,” and added entries. The General Industry Digest has been reorganized alphabetically like the Construction Digest. Both Digests are available as a free download on the Safely Working Community Forum at Safe6.org. There are a number of other free downloads with more planned. Registration and moderator approval is required to access the Forum. Unfortunately, we’ve had to tighten up due to a spam attack over the Labor Day weekend. Not sure what they were selling as it was all in Russian.